ANAHEIM, Calif. — As is his routine, Jeff Trout, Mike’s dad, will be sitting at the breakfast table in Millville, New Jersey, reading the local newspaper, catching up on who’s doing what, who’s winning, who’s not, and where it is we all find ourselves today. Sometimes he’ll get all the way to the obituaries, which, he admits, happens more now. Get to a certain age and curiosity gets the better of you. It gets Jeff in the heart every time. Every time. His boy, Mike, really does that to people. For people. Gives folks something to do, something to believe in, something to root for. A local guy. A good kid. Somebody who smiled and said hi, who comes home and loves them all back. Mike will go off and become famous and rich and win awards and whatever else comes with baseball and excellence, and what romances his ex-ballplayer dad is that it means something. The rest is baseball, which is what Mike Trout does and, as Jeff and Debbie Trout insisted Mike understood every time he walked out the door with a bat over his shoulder, not who Mike Trout is. They sat Sunday under a hard sun watching the theater of their son becoming a Los Angeles Angel for, perhaps, the rest of his career. The Angels paid him well for the commitment. Fans standing behind metal barriers chanted his name and “MVP! MVP!” Mike smiled and said hi, the way he does, his head slightly bowed, his shoulders rolled slightly forward. The potential complication is when that kid with the bat over his shoulder and the promise to be home by dinner becomes about the best player people had ever seen. Only the kid wouldn’t have any of it. If there’d been anything to learn from this winter, it was not that baseball owners are averse to the players of free agency, or even the financial risk of free agency, it’s that they apparently didn’t like the competition of free agency. They need the player. They have the money. They do not want Daddy Deep-Pockets from wherever backing them into something slightly uncomfortable or, from the players’ perspectives, something wholly merited. There’d been 21 contract extensions this winter, 22 if one were to count Clayton Kershaw, and that three-year, $93-million deal walked and talked like an extension, even if it technically were not. Of those, of any of the contracts, Mike Trout’s was the longest and richest, as he was among the youngest and without question the most capable. The final numbers on that came in at $426.5 million over 12 seasons, starting soon, and on Sunday afternoon at Angel Stadium, under a freshly warm sun and the usual reservations about who the Angels are to be, they celebrated. 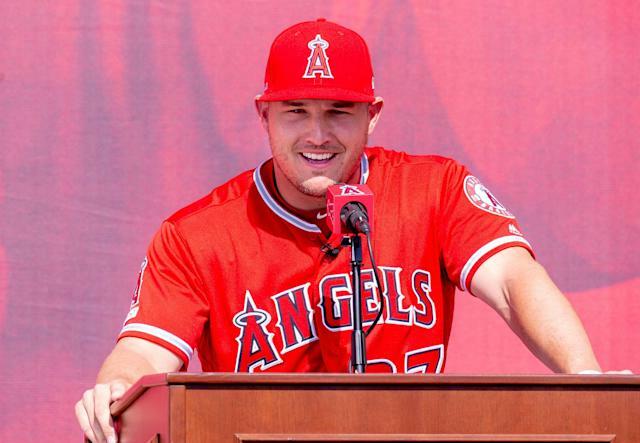 Mike Trout and his family and hundreds of fans grinned and waved on a plaza where music played and men in suits and sunglasses spoke and everyone agreed this was a good thing and now the Angels need to, you know, win some baseball games. Trout himself, of course, looked probably like he did when he made his high school varsity team, like he did when he went home one evening and announced there was actually a real scout at his ballgame, like he did when he hit his first over-the-fence home run. That is, happy and proud and still a little uncomfortable with all the attention. The rest was getting from here to there. Forgetting about going home to Philly. Skipping a free agency that surely would have brought us back to the bidding wars of yore, even if that’s what had been predicted for Bryce Harper and Manny Machado, how their free agencies looked different than that. Finally, believing in the Angels’ view of tomorrow, their commitment to it, their capacity to make good on it. There’s probably something to be said for loyalty, from all sides. The team, whether it be the Boston Red Sox with Chris Sale, the Colorado Rockies with Nolan Arenado, the Houston Astros with Alex Bregman, believes in the player, knows the man, knows the family, and believes it can live, even prosper, with all of it. The player, having watched free agency become a ghoulish spectacle that is part negotiation, part door-to-door sales, part sad parade, is thus convinced of the comforts of familiarity. The Angel you know, like the devil you know. What else the 12-year contract, the last 10 of which was brand new, brought to light was Trout’s true assessment of the Angels, of Arte Moreno, of a rotating baseball ops department, of a new manager even. None had been savvy or lucky enough to put a sturdy 24 men around Trout with any consistency, so that while Trout was amassing MVP votes over seven years the Angels in that time had three winning seasons and were a combined 34 games over .500. Trout did not complain. He is not, at least publicly, a complainer. And while the world wondered just how long Trout would agree to live somewhere in the middle of the AL West, with an out coming after only two more seasons, he signed up for more, for what amounts to be forever, and now the best thing the Angels, Arte Moreno and the baseball ops folks have going for them is the fact -- or at least the impression -- that Mike Trout believes in them. He sat this Sunday afternoon on a dais with his team’s owner, president, general manager and field manager. His agent was up there. To his left, his wife, Jessica. In front of him, his family, including Jessica’s parents. Behind them, dozens of players and staff in Angels red. Albert Pujols had sat up there on a day not unlike this one. So had Shohei Ohtani. Out toward the parking lot, behind metal barricades, people hoisted posters and signs and fishing nets. It felt new again, 1,065 games later, and also so familiar. 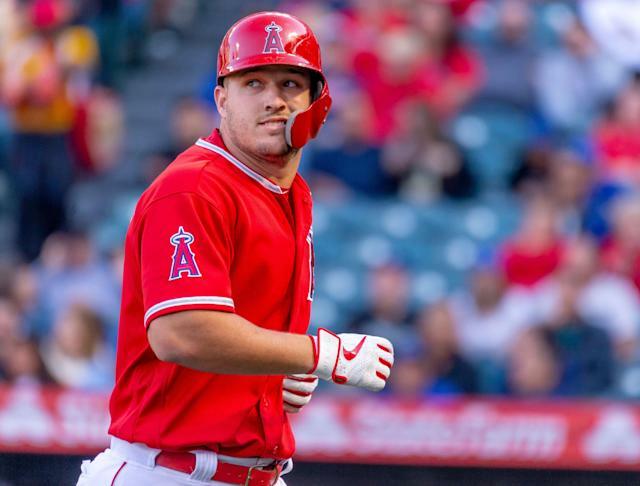 As a baseball game against the Los Angeles Dodgers drew nearer -- two hours away, then an hour-and-45, and an hour-and-a-half -- Trout jokingly checked his watch. Laughed and spun his finger -- pick up the pace -- at the emcee. He found his parents in the crowd, up front. You got the sense he’d rather have been sitting down there with them. “Thanks for all the support,” he said. He gathered himself. The crowd cheered. “You guys are great,” he said, trying not to look anymore. So, here they are, the Angels and about the best thing that’s ever happened to them, a guy named Mike Trout. A ballplayer. Maybe they’ll grow better together, though Trout has carried his end of that for a long time. Now it seems they’ll grow old together. One day they’ll look back, Trout having stacked all those LAA’s on top of each other on his baseball cards, the Angels having done the right thing to ensure it happened. A whole generation will have passed. The Angel you know. Several hours later, Jeff Trout stood high above and behind home plate. Mike had doubled earlier. They were going to stay in the area for a few more days, then go watch the Angels open in Oakland. Maybe, had Mike waited, these trips across the country wouldn’t have been necessary. Maybe he’d even have landed in Philadelphia, not an hour from where Jeff’s morning paper lands, and all those folks who know Mike as one of them. “I know this will sound strange maybe to the people back home,” Jeff said, “but he’s got the best of both worlds here. … People have to remember that Mike is a loyal guy. The Angels took a shot, took a chance, on this kid from New Jersey who maybe wasn’t going to be a first-round draft pick. They brought him up to the big leagues at 19. They paid him handsomely. They treated him so great. They treated us, his family, the same. I think that loyalty is important. And I’ll probably get some people in Philly mad, but I always deep down thought and hope he’d stay with the team he signed with.